In 1969 a couple of musicians from Viareggio band Gli Eremiti (Luciano Casa and Jimmy Santerini) joined a band from Livorno (I Rangers), and the resulting five-piece was called Capitolo 6. Two drummers were included in this line-up, though Luciano Casa mostly played 12-string acoustic guitar and sang backing vocals. The group obtained a record deal with RCA subsidiary It (thanks to RCA producer Roberto Tessandori, who was also from Viareggio), a label that was much interested in singer-songwriters than in rock groups, and the first single appeared in 1971, the group being by now based in Rome. They had a promising live activity, playing at Viareggio festival in 1971, and even supported Led Zeppelin in Rome, but 1972 saw a line-up change, with original members Casa and Santerini leaving. New keyboardist Antonio Favilla and sax/flute player Loriano "Fischio" Berti were taken in; Berti left after not long (he's credited on the LP among the composers), and the remaining quartet released their first and only album in the same year. 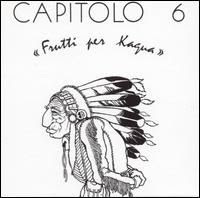 Frutti per Kagua is a mixed album with two very different sides, the first one containing the 22 minutes long title track, with flute in evidence and a good sound. Guitarist Bartolotti was responsible for the heavier sound of the group. Side two contains three shorter tracks with good lyrics (by italian songwriter Francesco De Gregori) but less inspired in their musical content. A single with Il grande spirito (with an unreleased track on B-side) was also taken from the album, but the band decided to split due to the lack of success. They had also been featured, singing other artists' songs, in some RCA compilations released throughout the world for the Sanremo 1972 festival (see details below). Keyboardist Antonio Favilla was involved in the short-lived second line-up of Campo di Marte, he had drug problems and sadly died in the early 90's. Even original keyboardist Santerini died from leukaemia in 1977.